After Wisdom Tooth Removal in Silver Spring and Hyattsville, Md. Wisdom tooth removal is a surgical procedure that requires effective aftercare for proper healing and recovery. Your dentist will give you specific aftercare instructions to follow after the procedure, but there are some things to be aware of for the post-operative period so you can recover quickly. At our dental offices in Silver Spring and Hyattsville, Maryland, we provide all the necessary information to ensure a speedy and hassle-free recovery for our patients. With proper aftercare, it may take around two weeks to recover after wisdom tooth removal. You will notice some improvement every day. Within 24 hours, blood clots will form. Swelling of your mouth and cheeks will improve within 2-3 days. Stitches, if any, are removed within 7 days. Jaw stiffness and soreness will go away within 7-10 days. Mild bruising will heal within 2 weeks. Will I bleed after my wisdom tooth removal? Some bleeding the first day after surgery is normal. If you have excessive or severe bleeding that will not stop, you should call your dentist right away. Your dentist will place a gauze pad over the site to help control the bleeding immediately after the procedure. Keep a slight pressure on the gauze for at least half an hour, so that the site has a chance to form a blood clot. After that, replace the gauze or bite down on a moist tea bag if you still see blood. It is important that the site that forms a blood clot isn’t disturbed. Therefore, you should avoid using drinking straws and smoking. You should also avoid alcohol and carbonated beverages as these can cause the blood clot to become dislodged, resulting in increased bleeding and a painful dry socket. It is important that you get an adequate amount of rest following any oral surgery procedure. You should rest the day of the surgery as well as the following day. After that, it is ok to proceed with your normal, daily routine, however, you should avoid strenuous activities, such as intense exercise, for about a week after the surgery. What should I eat after my wisdom tooth removal? Even if you do not have an appetite, it is important that you get adequate nutrition following oral surgery. Do not skip meals! If you have been given pain medication, do not take it on an empty stomach. 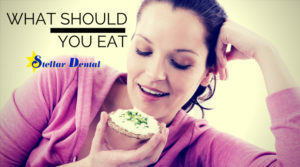 What not to eat after wisdom tooth removal? Avoid sticky foods that require chewing such as candy or gum. Avoid hard or crunchy foods like nuts, chips, and pretzels. Will I be in a lot of pain after my wisdom tooth removal? Most patients report that pain is mild to moderate after wisdom tooth removal. There is some pain that lasts for the first 24 to 36 hours, but this should diminish after the third day. Your dentist may also advise you to use an over-the-counter pain reliever, such as ibuprofen for pain. If your dentist gives you pain medication, you should start taking it before the anesthetic wears off and discomfort starts. If unable to eat prior to taking medication, juice or a full glass of water will suffice. Do not take aspirin for pain as it can interfere with your blood’s ability to clot. Aspirin should not be taken a week prior to surgery. Contact your dentist if you are still in severe pain 24 hours after your procedure. When laying down, lie with your head slightly elevated to help reduce swelling. For the first day, use an ice pack to keep the swelling down. Apply it to the cheek for 20 minutes, and then remove it for 20 minutes. After the first day, heat can be used to bring the swelling down. Use a heating pad or moist heat for 20 to 30 minutes at a time. Contact your dentist if your swelling persists after several days. How do I take care of my oral health after my wisdom tooth is removed? Following your wisdom tooth removal, brushing and flossing are probably going to be the last thing on your mind! However, it is important, as always, to keep your teeth clean. Brush and floss your other teeth as usual. Avoid strenuous brushing around the surgery site for a week following your wisdom tooth removal. Gently brush around the removal site with a soft toothbrush the week after your procedure. Your dentist may prescribe an oral antibiotic rinse to help kill any bacteria around the surgery site. Gently rinse your mouth while rinsing. Feel free to call us if you have any questions about your wisdom tooth removal or how to take care of yourself after the procedure. 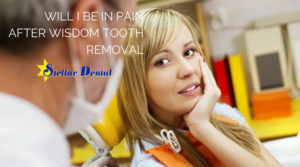 If you need any assistance after your wisdom tooth removal, you can count on Dr. Allen Gotora and the staff at Stellar Dental to help get you back to your everyday routine! Call us at (301) – 754-1900 (White Oak Office) or (301) – 853-1567 (Hyattsville Office) and make an appointment today!